Sarena presents over ten yearsâ€™ experience in the property sector with a natural focus on the high end residential market within the greater Queenstown area. 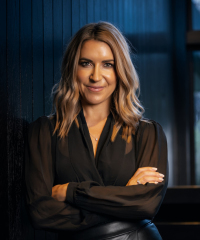 After her European travels and working on luxury super yachts, she re-joined the New Zealand Sothebyâ€™s International Realty team to set up and manage the Luxury Rental Homes division which is now the largest portfolio of luxury rental homes in the Southern Lakes region. Sarena then decided to go back to where her passion lies within Real Estate sales. Married to Simon and a mother of two, Sarena has a strong local family presence and network in the region and is a former New Zealand Alpine Ski Team member and avid sportswoman. Sarena brings extensive experience to both residential and commercial property and holds a Bachelor of Commerce degree majoring in Valuation and Property Management. Incredibly detailed with strong communication skills, combined with her professional and friendly manner, she gives her clients and customers a fresh approach to Real Estate.